For some time archaeologists have disputed whether manioc was a significant foodstuff of ancient Mesoamerica. While it seemed a logical possibility, there was scant hard evidence to support the thesis. Now a University of Colorado – Boulder team has uncovered an ancient field of manioc at a Maya site in present El Salvador, providing the first substantive evidence of the ancient use of manioc as a food crop in Mesoamerica. Manioc, also known as cassava or yuca, is a member of the spurge family. Its potato-like root is often said to taste like a mixture of potato and coconut. It is extremely starchy and therefore is a good source of calories. 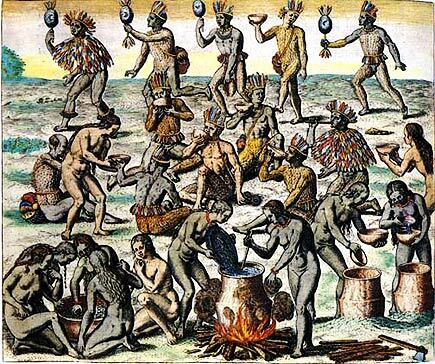 The image, Native Women Preparing Manioc for a Feast, by Theodor De Bry, is from Colonial Latin America. De Bry (1528–1598) was a Flemish engraver and publisher who specialized in depictions of explorations of the Americas (which he never visited).